Artist Robert Templeton served in the U.S. Army, where his sketches and photographs appeared in the Army newspaper The Stars and Stripes. 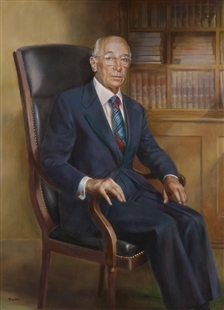 He shows Armed Services Committee Chairman Melvin Price with an extensive library in the background. 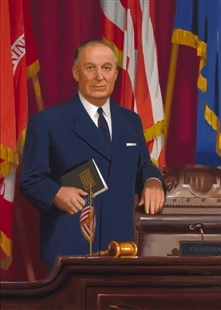 In earlier decades, most chairmen’s portraits used a plain setting, but by the late 20th century, Chairmen were more often depicted in the surroundings of their work with tools of their authority. Books, gavels, desks, and sometimes the committee rostrum became commonplace. Typical of portraits in this transitional period, this painting combines details of a specific setting—Price’s library—with the vagueness of an indeterminate background.